District Governor Martin and Denise Garcia had their official visit to Tawa Rotary on Tuesday 12 July. DG Martin has captured his visits to Tawa via his blog entitled: Tawa Rotary is connected and generous. 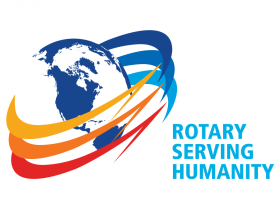 With the forthcoming centennial celebration of Rotary Foundation, Rotarians are encouraged to contribute personal donations to this worthy charitable trust. Also of note is the End Polio Now campaign that is so close to world-wide eradication of this debilitating disease – we will need to continue this effort as polio is still around and people need to be vaccinated. President Andrew also welcomed Past District Governor Simon Manning, Assistant Governor Lee Wilkinson, past President for Inner Wheel NZ - Di Patchett, Rotary Exchange student – Helena Sader Heck, and guests. PDG Simon announced District’s acknowledgement of Tony Heyward’s significant contribution with club development and helping clubs to plan for the future. Congratulations to Tony who was awarded with a second Paul Harris Fellow within a week – PHF sapphire pin. Helena Sader Heck gave her farewell to Tawa Rotary as she prepared to return home to Brazil. She received a standing ovation as Mark Carroll noted her willingness to step up at every occasion to help with Rotary projects. Several Rotarians and friends went to the airport on Saturday 16 July to farewell Helena as she flies home to Brazil. Haere rā Helena - safe travels. Bruce Murray and Gordon Mygind are visiting Rotary on 19 July and will be talking about the Tawa Memorial project. This initiative is a three party engagement involving the Tawa Historical Society, the Tawa Community Board and the Tawa RSA. They have an application before the Lotteries Commission and are canvassing more local support to have the memorial built and commissioned by ANZAC Day 2017. We have a new District Website at: www.rotary9940.org. The July 2016 newsletter is now available- see more. “Can you pass this on to your Tawa female Rotarians and/or partners: Casual entry into any of our classes is $10 or join us with a membership and receive 10% discount. It would be lovely to have your club Rotarians join so that they can feel the benefits of a healthier lifestyle and improve their fitness. Original generation time 3.9024 seconds. Cache Loaded in: 0.0385 seconds.